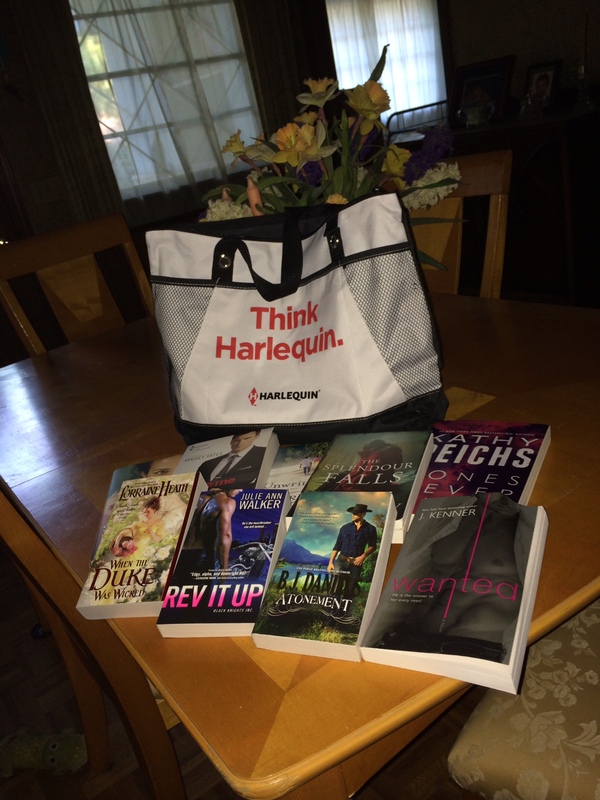 Tuesday Treats: Win Books and Fun Stuff! What do you have to do to win? Hrmmm. Let’s see… OH! Since there’s so much hoopla over Outlander, leave a comment and tell me which book or series you’d most like to see on STARZ or HBO or Cinemax or at your local theatre… 🙂 I’ll pick a random winner on Friday and mail the goodies to the lucky draw next week. Please US only because there are a LOT of books! This entry was posted in Writing Life and tagged books, contest, free books, fun stuff, pics, reading, RWA14, Tuesday Treats. Bookmark the permalink. 53 Responses to Tuesday Treats: Win Books and Fun Stuff! I used to have a whole bunch of books I wanted to see made into movies, but now I’m afraid they’ll ruin them. I mean, there’s this bestselling author whose books have been and are being made into a series of movies, and he refuses to go see them because they differ so widely from what he wrote. (Although, I also think it’s bad form to gripe about it so publicly.) And the latest scuttlebutt is that they’re making the Shannara novels into a TV series – GoT style – or some such nonsense. That actually makes me want to cry. Sooo, I’d like to say I’d love for all my friends’ books to get made into TV or movies so they can make bundles of money and write more books without having to worry how they’ll buy groceries next week, but I probably won’t enjoy the what the glam of Hollywood will do to the stories. My question is always in the casting. With Outlander, I hadn’t read the book/series so had no preconceived notions. But yeah, I hear ya, B.E. Loving Outlander. Can’t wait until Sat. Oh and I’m reading the second book, Dragonfly in Amber. Marked Men? I’ll have to check out that series, Ash! And yeah, I’d like to see Jen’s Plus One come to the screen too. Who would you cast as Sloane? Hmm Tom Hardy maybe? Just off top of my head. I’d have to think about that one. And oh you need to read Crownover! Holy cow! I love her voice and her tatted up hotties. Yum! Hrmmm. Two more series I’m not familiar with but will have to look up. Lots of people are really looking forward to FSOG. Me? Not so much. It’ll be interesting to see how it does at the box office! Monica McCarty has her Highland Guard series. I would love to see these made into a movie. Is it bad that all I really want is for them to do the whole Outlander series? That would keep them going for the next 8 years…. I’d love to see the Kate Daniels series by Ilona Andrews get made into a series. The books have some unique world-building, which I think would be very interesting translated on screen! Wholly Boogers….Now that’s a question that’s more like a loaded bullet!!!! I personally really want to see author S.L. Morgan’s Ancient Guardians series become a whole series on HBO/Stars/Cimamax or into a series of movies. I would flip to see how they do Pemdas. Who they use for the main characters Levi and Reece, and for my favorite HARRISON!!!!! Yes, it would totally be an adventure in itself to see if they could even capture 1/10 of the creativity from this amazing author’s work into a show. I would love to see any book of Maya Rodale. Her books have wonderful settings. I would be awesome to see on tv. Her historicals or her bad boy billionaires, Kimberly? JR Ward Black Dagger Brotherhood- thou casting would be hard to do them justice. I would love to see Joanna wylde’s reaper series as a tv show on HBO. I love that series and it would go so well on that type of channel. Yes! I’m a big Reapers fan, Rebecca. Can’t wait for the next one. With Sons of Anarchy probably coming to an end fairly soon, I think there’d definitely be room for the Reapers! OH, hellayeah, Tiffany! Question, though. Who would you cast as Charley and far more important, who could play Reyes? Because…REYES! That’s like trying to cast Roarke, ya know? Missy, the Anita books would definitely have to be on premium cable because…whoa! But yeah, with the right casting, I’d watch…so long as they didn’t go past Obsidian Butterfly. I have heard that several of B.J. Daniels books are being looked at to be made into a TV series. I hope they do a good job with it like the Hallmark Channel has done with Debbie Macomber’s books. Of Course Hallmark Channel is a classy place! BJ’s books could be there too! Ooh! I hadn’t heard that about B.J., Laura. Awesome. Longmire was a surprise hit on A&E so I think there’s an audience for that sort of modern western/suspense story. I’d love to see her on Hallmark, or anyplace else! Yes, always room for historicals, Michelle, especially if done well and there is a plethora of roguish men to…enjoy. 😉 I enjoyed Karen’s Highlanders, too. I’d love to see P.C.Cast, House of Night Series. Also all the Black Dagger Brotherhood series. These are 2 of My favorite series. Read both 2 times. But would hate to have the storylines change in a movie or series!!! I have always thought that JR Ward and her delicious Black Dagger Brotherhood would make an awesome series for t.v. Someone should really make it happen. Especially now that True Blood is done this year. I think Linda Label Miller’s series about the Creed boys would be a good show. I would love to see Melody Anne’s books that feature the Anderson Family as a series. Oooh. Yeah, Cindy. Good pick!